Photos from a private "Servants" tour of the Gibson House, an extraordinarily well-preserved Victorian (1860) row house in Boston's Back Bay. This was one of our monthly History Camp Boston outings. Read more about other outings and receive advance notice by subscribing to the History Camp Boston mailing list. All of the spots were gone within a few hours of when we announced this private tour in a mailing to that list. Thanks to Michelle Coughlin of the Gibson House for arranging the tour. Learn more about the Gibson House and browse upcoming programs on their page on The History List. To be notified of programs and events at the Gibson House and at other historic sites and institutions in Massachusetts, sign up for the weekly, "Guide to History Events in Massachusetts." The resources on The History List that deal with finding a job or an internship are among our most popular. (I've included links to several of them at the bottom of this post.) Over the last few months I asked a few friends who are at different stages in their careers and who have worked at very different institutions for their tips and insights as interpreters, guides, and docents at historic sites and living history museums. One of the more difficult parts of interpreting is feeling comfortable in the clothes you wear. While it is great to rely on a more knowledgable colleague to show you how to properly dress, take the time to do your own research. Study portraits, fashion plates, or photographs (if they are available to your time period). Read from primary sources about the fabrics/prints/ styles available to your region. People love to ask you about clothing. Make it your business to understand why you are wearing what you are wearing and how styles changed over time. You will be asked multiple times per day (sometimes per hour) if "you are hot in your clothes." You can always explain that they are natural fabrics and that you are used to them, or try to connect on a cultural level and mention that other cultures today wear layers in the summer. My advice? Come up with something witty as a retort, or you will eventually end up irritated. Your job is, yes, to memorize your script or your facts, but how you will stand out in your interpretation is if you can't elaborate on facts, connect to your public, or answer questions? The more you read on your interpretation, the more you will "own" it. Within your demonstration or tour, find an area of the time period that interests you. Read up on it. You can personalize your presentation in this way. If you are asked a question that you don't know the answer to, admit it. Keep a small journal nearby. Offer to take the individual's email and share what you find! If you're not comfortable on your own at first, ask a seasoned colleague to do the tour or demonstration with you, them jump in when you feel comfortable. If you are doing a walking tour, ask your group to participate by asking them questions, or give them leading statements and ask them to fill in the blanks. When you engage your group or visitors, they retain information better and feel as if they have ownership of their learning experience. Be prepared to have your picture taken a lot. More often than not, you will be photographed without your consent. You can deal with this two ways: Ask the individual to stop if you are uncomfortable or mention that you prefer to be asked first. Generally, they will get the idea. Unfortunately, if you are giving a tour, there's no way to really prevent this from happening from people outside your tour. If you are indoors and your site does not allow photography, you can post signs or gently remind your public. Sometimes people forget that you are a "real person" inside your "historic persona." This means they sometimes forget your personal space and will touch you, put their arm around you, and so on. Gently remind them that you are working and they will usually back up. Keep your patience at the ready. People come with all levels of historic knowledge. Most wish to learn. Use their questions, however silly, as a chance to educate. For example, although I portray an 18th century Bostonian, I have been asked multiple times if I'm Amish, a pirate wench, one of King Henry's wives, or Pilgrim. I take those questions as my opportunity to correct their misconceptions . . . and sell a tour. If repeated questions are intentionally asked to be silly, you can always use humor back to connect with your public. Just make sure they don't try to take over your interpretation. If they do, chances are your group is getting fed up with the antics. You can always politely suggest they move on, or seek employment at the local comedy show while you will finish educating your group! I got my job by going through the intern program and made friends with the guy who chose the interns. Nobody gets paid well. I get paid more as a grocery store clerk than my supervisors at my historic site do. The clothes are not a huge problem. You get used to them. I've learned to be a tougher person. I've had to man up to succeed in historical situation and in two short years I've developed an interest in farming. In fact, after a short time I was no longer interested in learning about the time period. I was more concerned with completing my daily tasks. The general public seems very unaware of the lowest level of information that we are trying to get across. However, if you treat them with respect you can connect with almost anyone. Whether prepping for tours or informal interpretation, it is easy spend hours (of your own unpaid time) researching about the museum or site's collections, exhibitions, and buildings, to feel prepared enough for visitors. The organization never compensates you for this ongoing work. No matter if the expectation "not to touch objects" is printed on a museum map, in addition to having signs on the wall and to having physical barriers near and over objects, people will inevitably touch the museum's collection. Sometimes, the touching of the collection is accidental, which is understandable because museum environments can be dark or we as human beings learn through touch. At other times, it can be frustrating when visitors tell you, "I didn't see the sign," or "I didn't know", despite the written, verbal, and pictorial requests they've seen and heard. You'll find that you have to continuously educate visitors that no matter how clean their hands are, hands still have oils on them and these could damage an object over time. As a naturally shy, quiet person, becoming a tour guide was definitely a learning experience. I had to get comfortable being loud, confident, entertaining. In fact, I'm still not sure I'll ever really be loud enough. Something that I always had trouble with as a tour guide was being entertaining. As a trained historian (with a background in museum work), my tours focused on converting good, solid, information, and a lot of it. Some people absolutely loved that, especially people who had some prior knowledge of American History. However, unlike other guides, I didn't work constant jokes and entertainment into my tour, so I think I was less appealing to less knowledgeable or more casual groups. In terms of getting offered the job, the actual interview was the easy part. The trickier part was getting through the door. Nearly everyone got involved either because they knew someone who was already employed (like me), or they had been recomme nded through one of the local college's history department. Another small group found the job through acting/theater websites and connections. In my experience, it's all about who you know, and knowing when to apply—interpretation jobs generally hire January - April, and especially in February. You're unlikely to find anything if you look at other times of the year. The pay rate at one historic site was set up so that you could make a ton of money if you worked hard and were lucky and had seniority. Tour guides who had been around the longest were given the best tours, like 11:00 AM on a Saturday, and they could easily make $300+ on a single tour (plus tips). As a newcomer, I was given the mid-week afternoon tours, and there were many days when I only walked away with the base rate. The trick is being flexible, and being willing and able to rework your schedule at a moment's notice. Flexibility was at times great and at others frustrating. Great because I could easily work this job about 1 or 2 others. It was less great, because you never knew when you'd have to change your schedule around to accommodate a new tour, or because a group was running an hour late. I enjoyed dressing up, generally, and I was lucky enough to have access to a few different outfits, depending on the weather. You are going to get sweaty and hot in the summer, and you are going to freeze in the winter, though. That's just how it works. Tips: In the summer, wear linen, it breathes much better than cotton. Wear a sun hat. If you have a kerchief, drench it in water before you go out. Don't let yourself get dehydrated. In the winter, wear looser garments so you can layer underneath them. I often wore jeans, a slip, and then my petticoat (the slip was to keep the petticoat from bunching up too much). Hand warmers in your pockets! Rubber bands below your knees to keep your stockings up. Projecting your voice is serious business. Ask experienced guides for tips. My favorite part of the job was definitely when there were people who were genuinely excited about what I had to teach them and they really cared. My least favorite part was then people just didn't care and they were on the tour because it was the thing to do. The best thing to know about being a good tour guide is that if you're really, really enthusiastic about something, eventually that's going to rub off on your group. Pictured, from the top: Fort Ticonderoga, aboard the Hermione when it stopped in Boston, Living History Farms (Des Moines, IA), and the Newport Historical Society's Stamp Act Protest (Newport, RI). We've revised the Conferences page to include courses. This was in response to several organizations that expressed interest in listing their courses, and especially their online courses. 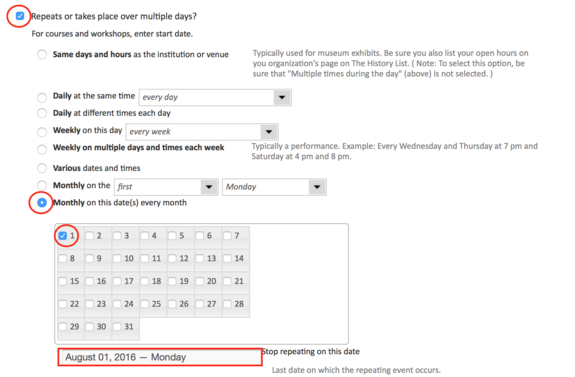 If the course takes place over multiple days, include more information about the schedule in the description, but when you add the date, list only the start date. A single course held once: An online course that is completed over a 30-day period. It has a start and end date. Explain this in the description. When entering the date, enter only the start date. A single course that is offered more than once: This online course is offered every month on the 1st of the month, use the start date when you add the additional times it's offered. In the example below, the course is offered on the 1st of the month from now through August, which is the last time it's offered. The description of the course would explain that it is a course that is completed over a 30-day period. 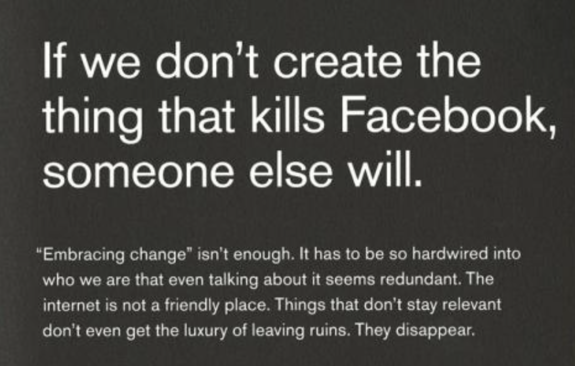 The innovation imperative and the pace of change, from Facebook's "Little Red Book"
Facebook's "Little Red Book"—really an unfortunate title for anyone aware of history—helps reinforce the company's philosophy, including on innovation and the pace of change. Two excerpts below, and more here. Running a historical society, history museum, historic house museum, or historic site is much different than providing an app or social service or other online product. And yes, there are a billion differences between Facebook the company and what we do as volunteers at or employees of history organizations, but there are some good ideas here. Granted, some will react reflexively and negatively, but perhaps that means helping people move out of their comfort zone, or at least getting them to think about change and innovation. Not suggesting change for the sake of change, or that the new thing is better than the old thing—far from it—but rather that we need to be thinking about why we’re doing what we’re doing and the possibility, and ability, to do something new. Inside BSA Space, owned by the Boston Society of Architects, was "White on White: Churches of Rural New England," a display of photographs of churches throughout rural New England along with several panels explaining the history of the preservation movement in Boston and the excellent work done by Historic New England. While I don't know how many people are drawn into the upstairs gallery to see this free exhibition, it's another example of putting history, and historic objects and exhibits, in places where people already are, as opposed to always relying people to come to your site or museum. I earlier wrote about Wells Fargo and their use of their heritage, including their famed stage coaches and the 10 small museums they have across the country, as examples of getting historic objects and displays out in places where more people will encounter them. While their motivation is somewhat different, the result is the same: More people, including those who may not go to history museums or historic sites, have the opportunity to learn about history.